Severe freeze events have historically kept mangrove forests in tropical areas, but with a warming climate and fewer freeze events, they have been able to move northward, encroaching into saltmarsh ecosystems. Both mangrove and saltmarsh ecosystems are extremely beneficial. They protect coastal cities from storm surges, provide a home for a variety of wildlife, and store tons of carbon. Because these ecosystems are so important, it’s essential to understand how mangrove encroachment will impact both ecosystems and coastal habitats in general! Climate change is a huge factor in mangroves marching northward. The black mangrove, Avicennia marina, is found further north than other mangrove species! Though black mangroves are freeze-intolerant, the mechanisms that allow them to survive short freeze events and expand even further north are not well understood. Both mangrove and saltmarsh ecosystems (along with seagrass beds) are called “blue carbon sinks.” They store tons of carbon in their sediment. If it weren’t for these ecosystems, there could be a lot more carbon dioxide in the atmosphere, worsening the effects of climate change. Because they are both such important ecosystems, we need to understand how mangroves and saltmarshes will interact with each other, now that they have begun to co-exist. The question is: how will coastal habitats be impacted? A team in Louisiana led by Christine Pickens and others at the University of Louisiana, set out to find the answer. They took black mangrove seedlings (baby trees) and propagules (seed-like structures), and placed them in saltmarsh plots along a latitudinal gradient inside and outside the mangrove’s current range. They wanted to see if the transplanted black mangroves could survive and expand beyond the plot. The study was conducted over two years. The researchers transplanted mangrove propagules and seedlings into saltmarsh plots in the fall of each year. Half of the plots had the marsh grass “canopy” removed, while the rest did not. The canopy refers to the uppermost part of the plant, which could provide shading to other smaller plants and animals, and protection from the wind and weather. The researchers hypothesized that the marsh canopy would cause a warmer microclimate (climate in a small area, in this case, the plot), allowing for better black mangrove establishment in all plots, due to insulation and protection. They also hypothesized that the intact canopy would reduce black mangrove seedling growth due to shading. They believed that shading could limit light availability for mangrove seedlings. In the first year of the study, the researchers found that the plots without marsh canopies had lower average temperatures and longer freeze events. They believe this is due of the warm microclimate that the marsh canopy provides. Plots with canopies were warmer and allowed mangrove propagules to establish in these plots; freeze events can kill off the mangrove seedlings quickly. With that in mind, it makes sense that the southernmost site had the greatest number of black mangrove seedlings survive, regardless of canopy cover, given that mangroves thrive in tropical climates. In the northern site, black mangrove seedlings only survived in plots that had a marsh canopy. In the second year of the study, all black mangrove propagules were able to establish in all saltmarsh plots. The canopy did not impact seedling survival or growth, except in the northern sites where propagules only survived in plots without a marsh canopy, though this result was not statistically significant. The researchers believed this was due to light availability, which could significantly impact mangrove survival at younger ages. 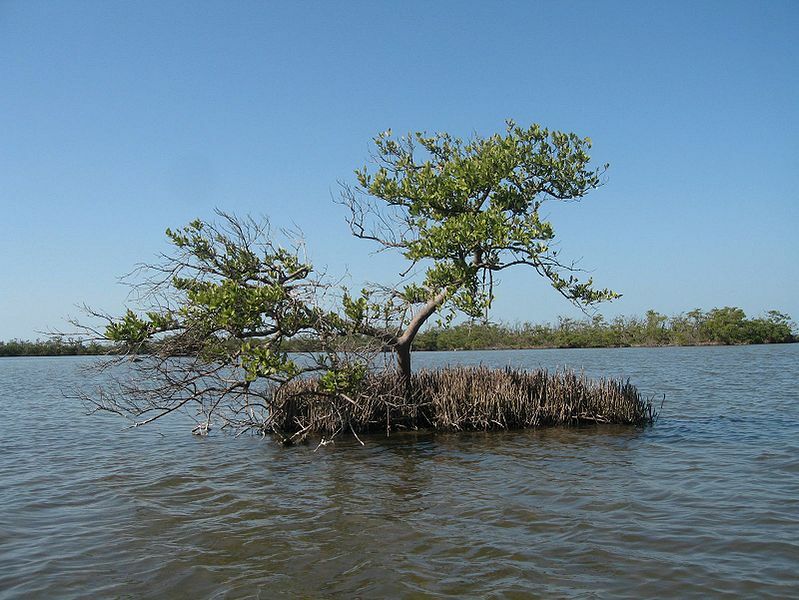 A free standing black mangrove in the Everglades, Florida. The take home message: there are many complex interactions involved! Mangroves and saltmarshes are both economically- and ecologically-important ecosystems, and the results of the study show just how complicated the interactions are between them! Mangroves may be moving northward, encroaching into saltmarshes, but it’s unclear just how coastal ecosystems will be impacted at their range limits in the future. Getting a better understanding of how these ecosystems interact in the face of climate change will help us to conserve both of these wetlands. There’s no telling how far these mangroves will march!